First SLR with built-in motor drive. Electronic shutter. Camera is dead without batteries, but those are 4 readily available AA alkalines. Use of rechargeables is dangerous for the circuitry. 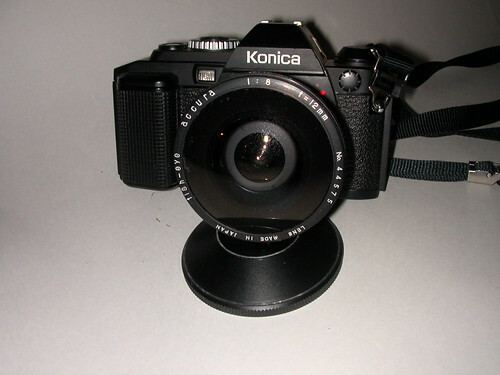 Full-featured SLR with Gallium Arsenide Phosphour TTL light meter. Shutter-priority auto-exposure. Uses LEDs as viewfinder indications. Konica AR bayonet. Shutter speeds 2s to 1/1000S and B. Extremely simple film load.